Romantic 1.30 ct. 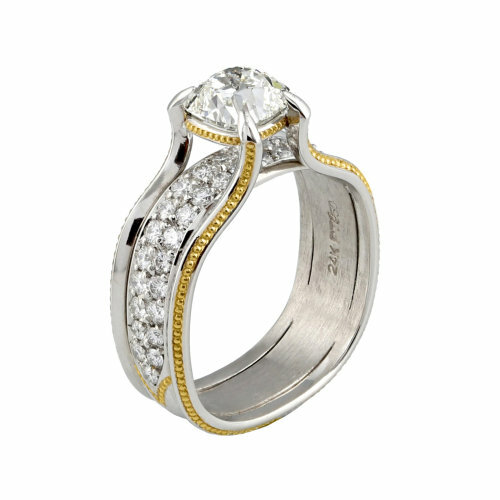 Antique Cushion cut Diamond in classic Platinum setting with 24K Gold shaped inlay. Romantic 1.30 ct. Antique Cushion cut Diamond (I color/ VS1 clarity, GIA Report # 1146948098) in classic Platinum setting with 24K Gold shaped inlay. Accented by an additional .65 ct. total of DEF color, Internally Flawless to VVS clarity Ideal cut Diamonds.